Recently (Friday November 25th) we published a new Forge release, Forge 14.4 for DSTU2 – FHIR DevDays 2016 edition. You can download the new Forge release for free from Simplifier.net. The previous Forge release (13.2) dates from June 10th, so clearly it’s been a while since we’ve published an update. In this blog post I’ll elaborate on the most important new feature: support for profiles on profiles, also known as derived profiles. What is a derived profile? Out of the box FHIR resources are designed to cover 80% of the common use cases. In order to cover the remaining 20%, FHIR introduces profiles. A FHIR profile defines a set of constraints on a standard FHIR resource or datatype. This allows you to define a specialized variant of a standard resource for a specific use case. 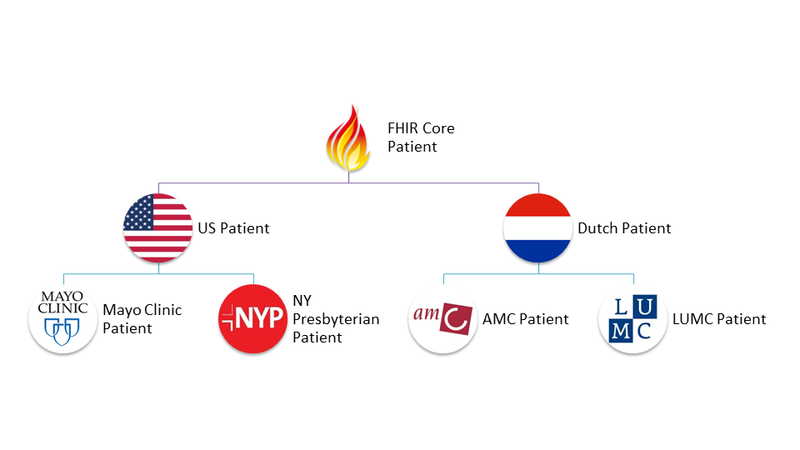 And because profiles are based on common FHIR resources, they provide a certain basic level of global interoperability with other (external) FHIR systems. Obviously, as we limit the context to a specific country, region or organization, we can probably harmonize more aspects and provide increased interoperability within that limited context. 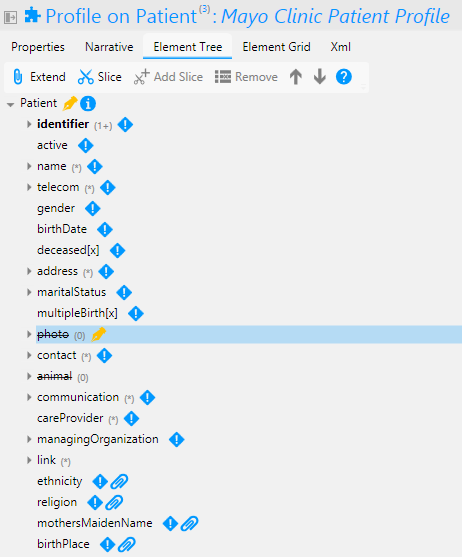 FHIR supports this common use case by allowing you to define so-called profiles on profiles a.k.a. derived profiles. A derived profile defines a set of constraints on another existing profile, the so-called base profile. The derived profile implicitly inherits all the existing constraints from the associated base profile. A derived profile can only further constrain the base profile, similar to profiles on core resources. The HL7 affiliate for the Netherlands publishes a national profile for a Dutch patient. The profile is based on the standard FHIR Patient resource and defines a number of additional constraints, e.g. in order to identify Dutch patients by their unique national social security number (BSN). The profile also constrains the generic Patient.careProvider reference to a specific Dutch practitioner profile. A Dutch hospital authors a derived Patient profile for use within the organization. The organizational Patient profile is based on the national Dutch patient profile and defines some additional constraints that only apply within the organization. 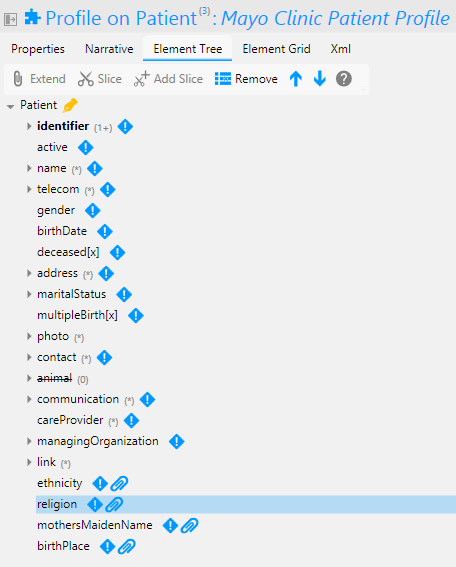 The hospital’s custom Patient profile defines additional constraints for the unique Patient identifier that is assigned by the hospital EHR system. The profile also prohibits the Patient.animal element, as it does not apply. As the example demonstrates, this allows you to create a hierarchy of profiles, e.g. on a national, regional, organizational and/or departmental level. As we navigate deeper down the profile hierarchy, we encounter more specific profiles for more limited use contexts. Using the new Forge 14.4 release, you can now easily author a derived profile. 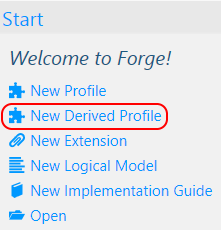 Forge 14.4 introduces a new command “New Derived Profile“. You can find the new command directly on the start screen, in the File menu and also in the Session Explorer toolbar. The new command resembles the existing “New Profile” command, but with one important difference: you can select an existing profile as the underlying base profile. Forge will display a File Open dialog window to select a suitable base profile from disk. After selecting the base profile, Forge will create and display the new derived profile. 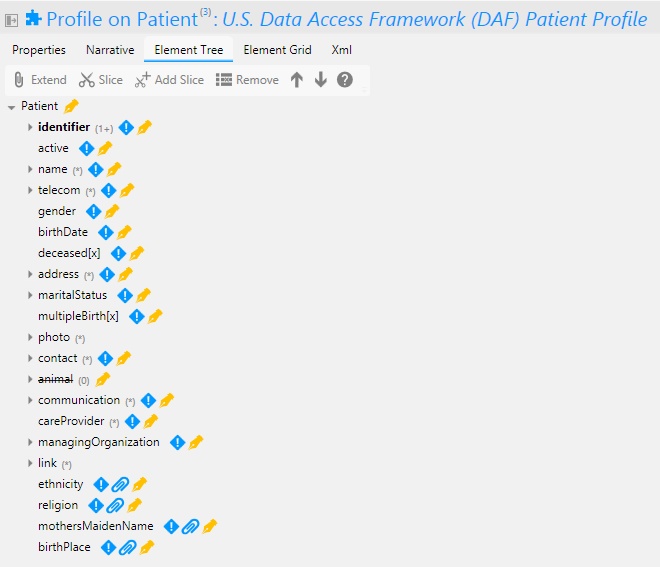 The screenshot demonstrates that the derived Patient profile indeed inherits all the constraints defined by the base DAF Patient profile (e.g. you can see the inherited extensions such as ethnicity). Because the implicitly inherited constraints are not defined by the derived profile itself, they are not considered to be part of it. This is clearly visible in the Forge element tree, as none of the elements in the new derived profile show a yellow pen icon (except on the root element, because the derived profile has a new name & url). In other words, the new derived profile shown above is (almost) empty. Below you can see the serialized XML of the derived Patient profile. We can clearly see the newly introduced constraint on the Patient.photo element. Note that the root element definition is mandatory in DSTU2, even if the element is not constrained. This requirement will be deprecated in STU3. Also note the (mandatory) reference to the underlying DAF Patient base profile. This concludes our introduction of the new support for derived profiles in Forge. The example demonstrates that the authoring process is actually quite easy for end users and quite similar to creating profiles on core resources. After all, in FHIR we try to move complexity away to the developers of tools and servers. As simple as this all seems to the end user, the actual implementation entailed a long and winding road straight into the bowels of the FHIR specification. In a separate blog post, I will provide some more in-depth background information about the technical challenges we faced when trying to implement support for derived profiles, and how we addressed these. If you have questions concerning (derived) profiles or need a bit of assistance, then you are strongly encouraged to join the online FHIR discussion groups. The FHIR community is very active, friendly and helpful and usually you quickly receive helpful responses from FHIR users all over the world. The conformance stream is specifically intended to discuss FHIR profiling and related tools including Forge. Also if you’ve implemented FHIR in a production environment, then please inform the FHIR community and share your story in the implementers stream! Today we have published a minor hotfix release (14.4.1) with a couple of bugfixes. Should you encounter any issues while trying to repeat the exercise above, then please make sure that you have upgraded to the most recent version. Users of release 14.4 will receive an auto-update notification. Users of earlier releases should manually download and install the new version. The new Forge release does not yet support base profiles containing slices. If you select a base profile containing slices, snapshot generation will fail and generate a runtime exception. We will introduce support for sliced base profiles in a future application update. This entry was posted in Forge, Profiling, Simplifier by Michel Rutten. Very nice addition and a very nice explanation thereof. Thanks for that. Q: New Derived Profile explicitly works based on an existing profile on disk currently. When Mayo wants to start from DAF, or when AMC wants to start from Dutch Patient, my expectation of that workflow is they would start from Simplifier where the profile is hosted, would they not? I’m sure that is on your short list already. Correct, we expect that to be a common use case. Currently, users have to visit http://simplifier.net/ to search and download relevant (base) profiles. In 2017 we will improve workflow support and Simplifier integration in Forge.